It’s been a while since I posted a recipe. It’s been even longer since I’ve had pasta; last week of May; reasons. I like cooking pasta because it reminds me of my Italian teacher in high school; HBHS for life! That man taught us all kinds of secrets for making pasta sauces. Of course, I learnt some watching my mother cook, too. And so, my dear three readers (Hi mum! 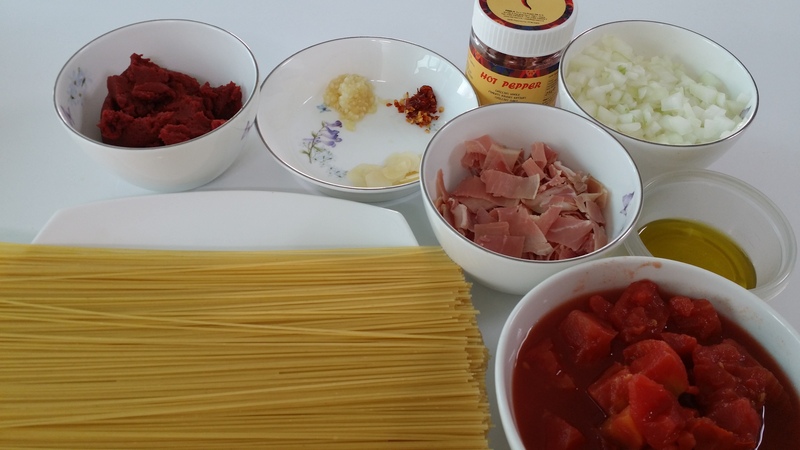 ), I present to you my capellini arrabiata recipe. Put a pot of salted water on your stove and bring it to boil. Add the pasta and cook according to the packet instructions. Generally, pasta shouldn’t cook for more than 11 minutes. Being so fine, capellini is usually done in 5 minutes. Drain the pasta and set aside. Now, get a pan and add your olive oil. If you want a little extra kick to your sauce you can put a few peppers into the oil while it heats up. Just remember to remove them before adding anything else. When the oil is nice and hot, fry your onions, crushed garlic, chopped peppers, and thyme for about 3 minutes. Don’t forget to enjoy that awesome smell of olive oil and onion. Add your water and let that reduce to about half. Add your tomatoes and tomato paste, along with the sliced garlic. Add a splash of vodka. The alcohol in the vodka will draw out the flavours of the tomatoes without adding extra flavours that would come with wine. Cook on high heat until some of the tomato juice has evaporated, about 5 minutes; we don’t want this turning into a soup. Taste and add salt/pepper/sugar accordingly. ONLY add a pinch of sugar, and ONLY a pinch, if you find the sauce is too tart. Get your drained pasta and add it to the sauce. Mix well and then serve. You can add Parmesan shavings as I’ve done below or some basil leaves as a garnish. For pairing, I like Chianti. It has a nice spiciness that goes well with this dish. The problem I have found with any arrabiata sauce in Korea is that restaurants tend to overdo the peppers; the saying “to a man with a hammer everything looks like a nail” perfectly describes the approach some restaurants take when they see a dish with any kind of red sauce. Some even add the fermented pepper paste; not a good idea. 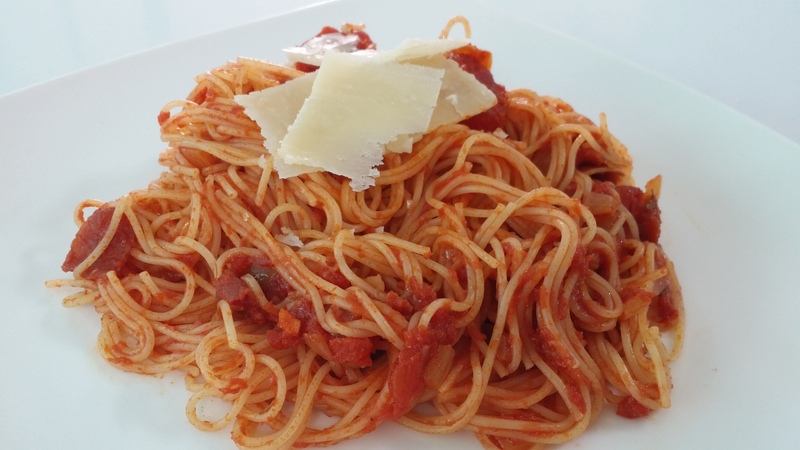 If you prefer a smoother sauce, put the cooked sauce throw a blender and then add to the pasta. I didn’t do this this time because I like the look of the sliced garlic and prosciutto. And now you know why I never order this at a restaurant.